Pavlo “Pasha” Antonenko has received the College of Education’s 2014-15 College Research Incentive Fund (CRIF) grant which will help the education technology faculty member conduct cutting-edge research on the neurological dynamics of individuals during group problem-solving activities. The COE gives its annual CRIF grant, worth $40,000, to education faculty members with promising and meaningful research projects that are likely to attract additional funding. 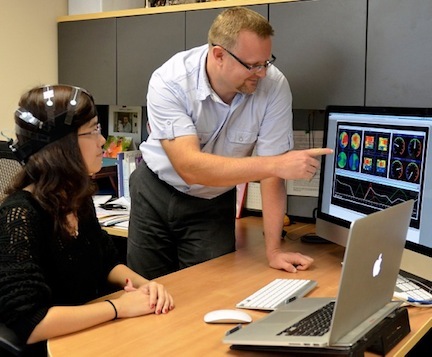 Antonenko, an associate professor, used part of his grant to buy the latest in wireless electroencephalogram (EEG) equipment that will allow him to measure brain-based factors involved in cognitive processing among student “teammates” solving a common problem. “The fun part will come when they put on the EEG headgear and their brainwaves show up on the computer screen,” Ukraine-born Antonenko said with a laugh. The EEG data, as well as behavioral measures of learning strategies and performance, will be analyzed to address whether neurodynamics — communication between different parts of the nervous system — align with behavioral measures of team problem-solving performance. “We’ll also try to see whether it’s possible to devise such neurodynamic models to assess, predict, and improve performance in problem-solving teams,” Antonenko said.